What modeling approach for long-term transitions? For at least two reasons our energy systems will face major changes over the coming decades: disruptive technologies are emerging, and energy and climate policies targets need to be met. Mainstream approaches, which emphasize relative prices, economic activity and assumptions about technological change are facing a dead end when radical structural changes need to be evaluated. Therefore, for the analytical analyses of the EnergyFutures project so to speak the black box of the energy system was opened an the full cascade from functionalities zo primary energy depicted and interactions for synergies considered. 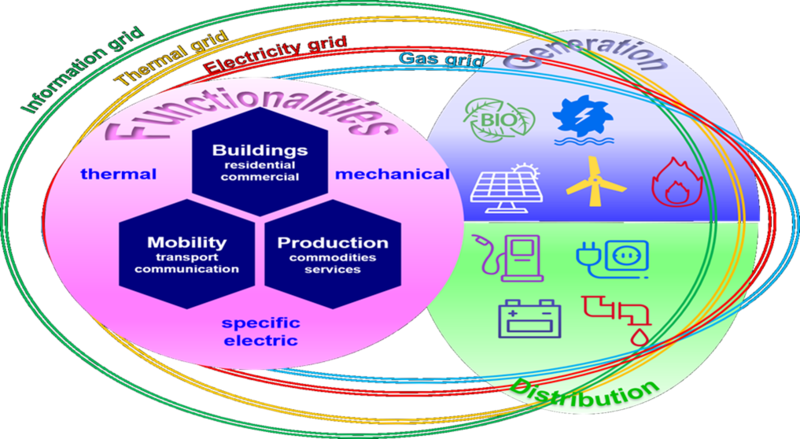 Three propositions distinguish theEnergyFutures Model from conventional approaches. 1. The entire energy value chain is taken into account. 2. Functionalities of the ultimately desired energy services are provided by the interaction of energy flows and related capital stocks. 3. All components of the energy system are linked via the electricity, thermal, gas and information grid. A deepened structural approach to analyzing long-term transitions of the energy system.